Samsung Helix is a XM2go Portable XM Satellite Radio which provides live XM reception for portable listening, as well as storing MP3s, WMA files, and XM satellite radio content in flash memory for playback anywhere and anytime. Beside, Samsung Helix lets the user “tags” and bookmarks songs heard on XM for online purchase from the XM + Napster service. 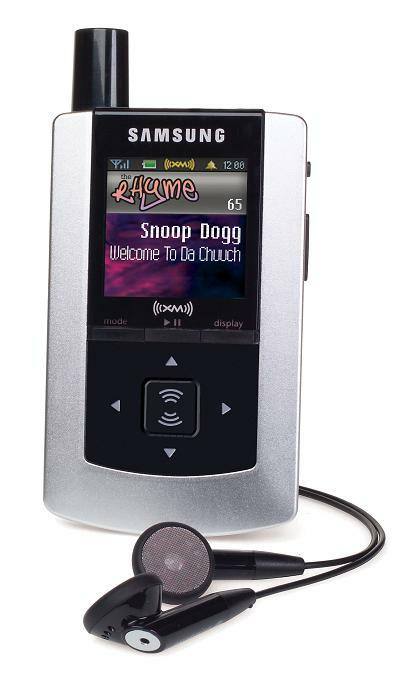 Samsung Helix features color display screen, ability to store XM content by song, by channel, or by scheduled session, ability to create unique playlists with a mix of XM content and personal music collection, enhanced storage features, customizable stock ticker and sports ticker, category list for saving and accessing favorite channels, TuneSelect which alerts the listener to a favorite artist or song whenever it is played on any XM channel and integrated wireless FM transmitter for beaming XM to any FM radio frequency. Samsung described the Helix as pocket XM radio receiver and recorder and is “TiVo for radio”. Gizmodo reviews Samsung Helix portable XM2go radio receiver and concludes that at the end of the day, you’re faced with quite a question if you’re in the market for a satellite radio. Assuming you choose XM over Sirius – to be frank, their music selection is remarkably similar, so it comes down to whether you like XM’s radio personalities, such as Oprah and the Opie & Antohny, or Sirius’, the biggest gun being Howard Stern who, it turns out, invented everything – the Samsung Helix, while not the cheapest XM radio on the market, is a remarkably versatile way to jump into the world of satellite radio. It’s important to note that Sirius’ “portable” radios don’t allow you to listen to live satellite radio once they’re disconnected from the home docking station, kind of defeating the purpose of portability, obviously. Sure, you could listen to that outdated-by-two-hours traffic report, but what’s the point of that?